A concert dubbed “Between Two Cultures” will invite the audience to experience the traditional art of the maqam at the Arabic Music Institute on 13 February. The evening will include compositions by Nahla Mattar (Egypt), Sune Kølster (Denmark), Shady Hanna (Egypt), Yara Al Nimer (Jordan), Kamal Ahmed Mustafa (Egypt) and Rossela Adel Samir (Egypt). The quartet performing the compositions will feature Khaled Saleh on violin, Mohamed Abdel Fattah on cello, Michael Onsy on oud and Mariam El-Mamlouk on piano. 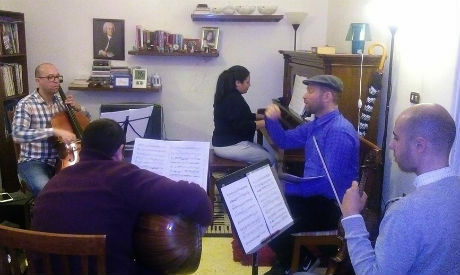 Organised by the Danish Egyptian Dialogue Institute and the Cairo Opera House, the concert is a result of a the "Maqam in Contemporary Composition" workshop spearheaded by Mattar and Kølster, who brought together composers with knowledge of both classical Western composition and maqam tonality, and who were willing to explore new layers of intercultural collaboration. Literally meaning "a place", the maqam is a famous genre of music common in North Africa, the Middle East and Central Asia with a unique modal structure. Although maqam has been practiced for several centuries, in recent decades it has been overshadowed by other more popular music traditions, including those coming from West. However, in recent years a younger generation of composers and musicians in the Middle East have begun to look into their musical heritage and build further on its richness by exploring maqam, and taking advantage of a number of initiatives to promote the genre, including masterclasses, workshops and concerts. One of the newest such initiatives is the Maqom Art International Forum which first took place in September 2018 in the Uzbekistani city of Shakhrisabz, 80 kilometres south of Samarkand. Musicians come from a number of different regions to perform, including Egyptian musicians.